UPDATE 22 July 2008: The website on which this post is based is no longer active. Please refer to favicon generator and host for an updated post. A "favorite icon" or favicon (pronounced fav-eye-con) is a 16x16 pixels icon that appears next to a website's URL in the address bar of a web browser. If you are using a browser that supports tabbed browsing, the favicon will also appear next to the page's title in a tabbed document interface. If you look at the top of this page, at the left hand corner of the address bar, you will see a small graphic of a portion of a fake red-yellow-black "for Dummies" book cover (This has changed to a rare photo of myself laughing). That is the favicon for this blog. If you are using FireFox or Opera, you will also see that icon in the tab. If yours is a personal blog, a good icon will be your personal photo. Adding a favicon to your blog is a good way to distinguish your blog from the millions of other blogs. To add a favicon, you need to generate a .ico format file, a place to host the file and add 2 link elements in the <head> section of your template. To generate the .ico file and to host it, you can go to MyFavatar. You need to have ready a roughly square graphic saved to your hard disk. This was how I added the favicon to this blog. 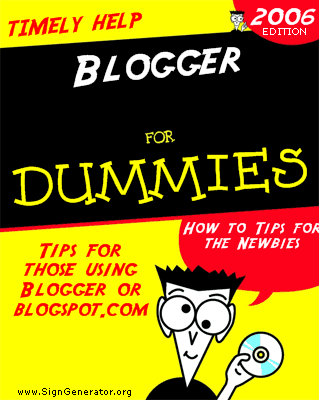 I had a fake "Blogger for Dummies" book cover generated by Dummies Book Cover Maker 2006. You can see the graphic here. signgenerator.org can generate other types of sign for you. (If yours is a personal blog, a good graphic to use will be your personal photo). I then use the free Irfanview to crop the bottom-right of the graphic and saved it to the hard disk. I then uploaded it at MyFavatar which also generated the codes for me to paste into the <head> section of my template. Update: I have since changed the favicon to a photo of myself laughing. It was also cropped from a larger photo using Irfanview photoeditor (click "BACK" button to get back to this page). Update: I have discovered that the favicon doesn't appear in Internet Explorer 6. It works for FireFox and Opera. Further update: It does work with IE7. See the comments. message will say Favatar changed. paste scrip just below the tag. Update: I have tried uploading a 550px wide photo and this caused no problem in FireFox and Opera, but caused the sidebar to slide down to the bottom of the page in Internet Explorer.